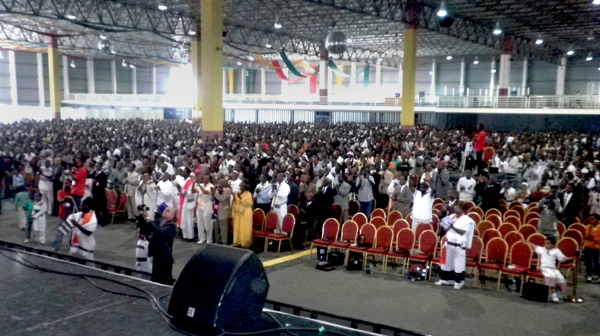 Addis Ababa, Ethiopia (February 13, 2011) – The second day of the Ilaamee Mission Conference of the International Oromo Mission and Cultural Convention in Addis Ababa started on Sunday at 9 a.m. with a crowd of close to 10,000. (On Saturday there were about 7.000.) There were several children’s and young adults’ choirs having between 50 to 100 singers and dancers. The Lutheran Church has been known as the church which sings and—praise God— the Ethiopian Lutherans honour this reputation as I witnessed them singing for more than two hours and involving the large crowd. They show a strong understanding of, and affection for the Word of God and to sharing it through music, singing and repeating key Bible verses through praise songs. One song was adapted from Isaiah 40:28-31: “I love you, my Lord, because you are my strength and my protection.” The children sang “We are children of Light through the plans of God”, based on Jesus—the Light of the world—and his encouragement for us to let our light shine. After a Gospel call message by Dr. Gemechis Desta Buba, about 20 people came forward to receive a prayer as they were brought to Christ through the Gospel and joined the Christian faith. There were several moments of sharing in the Word of God and prayer. It was a true celebration as an expression of gratitude for the blessings the Lord has providing for the Lutheran church in Ethiopia and in the world and for the opportunities to share the Gospel freely in this country. The foreign Lutheran delegations greeted the convention on behalf of their synods. The audience cheered in appreciation upon hearing about LCC and Canadian Oromos establishing a partnership in the Gospel of Jesus Christ in Canada and Ethiopia. 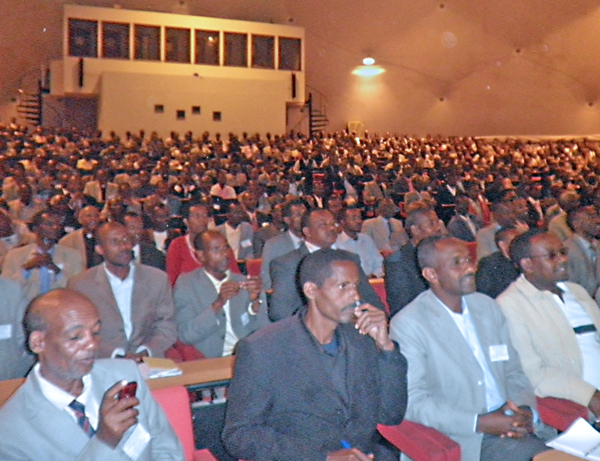 The celebration continued for the whole afternoon and the only empty seats in the auditorium those once occupied by the foreign delegates who were bused to the palace of the Prime Minister of Ethiopia, Mr. Meles Zenawi. 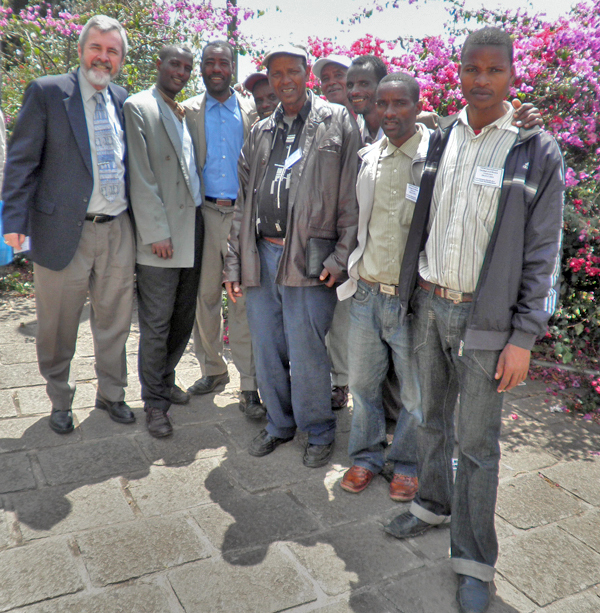 The meeting was arranged by the Ethiopian Evangelical Mekane Yesus Church. This was a very special moment as the prime minister showed some video clips and spoke highly about his country and administration. He noted that Ethiopia is in a new era of growth and development economically, educationally, socially, medically, and especially in the area of construction and farming. He also mentioned about the freedom of religion in his country and about the strong presence of Christians and the Lutheran contribution. He emphasized the Biblical foundation of the country as some of the Biblical accounts relate to the people and the country Ethiopia. The president of the EEMY, Rev. Dr. Wakseyoum Idossa and Dr. Buba expressed our gratitude to the Prime Minister for making himself available on a Sunday afternoon to meet the Lutherans. 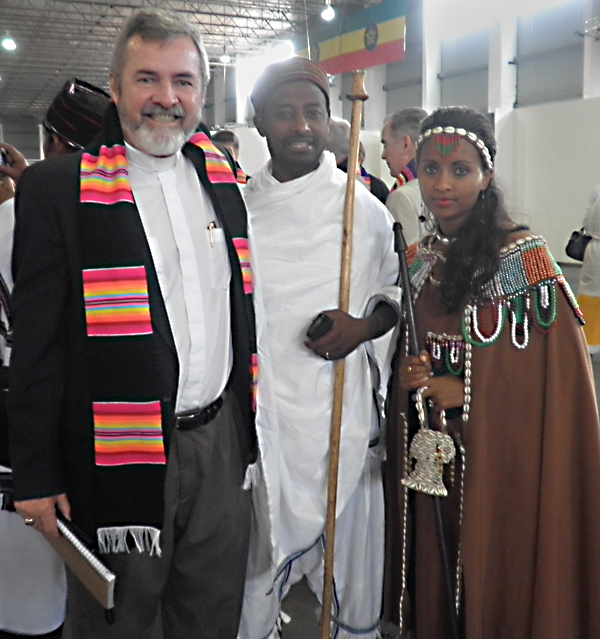 Dr. Neitzel and an Ethiopian shepherd and his wife. Ethiopia, a land of 1.14 million square kilometers, with a population of 80 Million, is 83.9% rural and 16.1% urban, with many languages, Amharic and Oromo the two largest. Other language groups are: Cushitic, Semitic, Nilo-Saharan, Tigeryna, Guragyna, Aquwat. Including English, there are about 83 languages spoken in Ethiopia. The 5.4 million Lutherans set an example as they are faithfully committed to the Word of God, to the Lutheran faith and confession, and to sharing the love of Jesus with their countrymen – and they do it joyfully through words spoken, sung or danced. As we welcome the Oromo communities into the fellowship of Lutheran Church–Canada, we thank and praise the Lord for the tremendous service Ethiopian Lutherans have undertaken for the sake of the Gospel. Through their focus, readiness and service they do not want to lose sight of the growth and steadfastness of their brothers and sisters in the Lutheran church as they move to other countries. Their Christian faith and testimony is vibrant and they are willing to take charge of any opportunity to share the love of Jesus Christ. Rev. Dr. Leonardo Neitzel is responsible for Lutheran Church–Canada’s overseas mission program and supervises LCC’s Pastors with Alternate Training program which prepares students for cultural-specific ministry.